The price for all this power is almost too good to be true - these will fly off the shelf. A little fizziness with some distortion sounds. Digital modelling is a wonderful thing, making it possible to carry around a whole truckload of virtual amps and effects in one small box. For manufacturers though, technology is a double-edged sword, because there are constant changes that make it difficult to stay ahead of the curve. Fender has always been out in front when it comes to innovation, with digital modelling products like the Cyber Twin. Now, its popular digital Mustang series has been refreshed with the Mustang GT, the first amps to feature Wi-Fi and Bluetooth. Let’s look at the smallest and most affordable in a new, three-combo range: the Mustang GT 40. Compact and stylish, the Mustang GT 40 is presented in black textured vinyl with a black control panel and grill cloth, offset by the old-style flat aluminium Fender badge. The control panel and display both point upwards, which means the Mustang needs to be low down if you want to see what’s going on. The controls are conventional with a set of gain, volume and tone knobs and a small but very sharp colour display, a handful of soft-touch button switches and a rotary encoder incorporating a ‘push to select’ switch. The more interesting stuff happens underneath the hood on the Mustang GT 40’s printed circuit board. The GT 40 is Bluetooth-enabled, so that you can hook it up to your phone, and it has Wi-Fi, which Fender claims is a first. 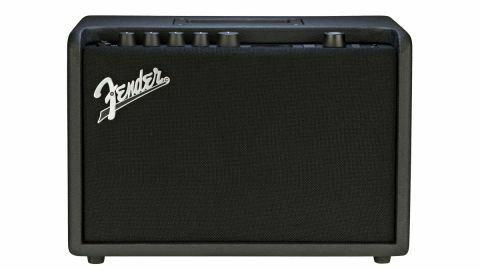 This amp can access the internet directly without being connected to a PC, handling its own firmware updates and downloading presets and patches from Fender’s Tone portal. Fender Tone is the new app for the Mustang GT. The mobile app allows full control over the amp, with a seamless connection to Fender’s online portal and you can also stream audio from your mobile to the amp over Bluetooth. Set up is easy: connect the Mustang GT to your Wi-Fi network, register the amp, then download firmware updates and add to the 100-plus presets that come ready loaded on the amp. The Mustang GT 40 promises new, more realistic amp and effects models and spillover when changing patches so reverb and delay tails aren’t abruptly cut. The core sounds are superb with 20 amp models, mostly inspired by classic Fenders from the tweed and blackface eras but a fair smattering of British sounds as well, together with dozens of delays, modulation, stomp-box and reverb effects. Amps like the Mustang sell themselves though their preset sounds and the GT 40’s are impressive. Whoever programmed them has mostly resisted the urge to show off what the effects can do, resulting in patches that are instantly playable and usable. The updated software allows you to tinker with effects positioning in the signal chain, putting one or more stompboxes in front of the virtual amp and delays, or modulations after it. This new feature significantly boosts the Mustang GT’s creative possibilities; guitarists who like tweaking presets have an almost infinite range of choice. The amp’s small screen means that there’s quite a bit of page shifting, but it’s not too tedious as the interface is generally well organised - and, of course, you can always use the app. With 20 watts a side in stereo, through a pair of full range 6.5" speakers in a ported enclosure, the Mustang has impressive volume and clarity, not quite big enough for drum-powered gigs but more than enough for home practise, rehearsals and recording. The design is well thought-out and perfectly executed; it’s hard to put a finger on anything that’s less than excellent. Some of the bigger distortion sounds tend towards a little fizziness, but this can be easily fixed with a few tweaks of the EQ controls, or the Mustang’s global EQ settings. The new app and online portal are seriously good, putting a world of tone at your fingertips.